Grab your furry friends for another 'yappy hour' at the Palm Beach Hibiscus House Bed and Breakfast & Backyard Bar! *Drinks and hors d'oeuvres will be served. The Palm Beach Hibiscus House Bed and Breakfast is an eight-bedroom inn in the heart of downtown West Palm Beach. 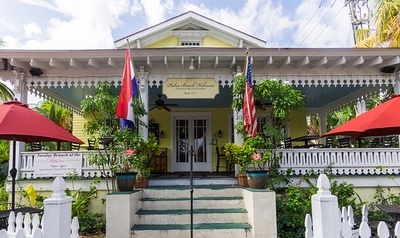 The intimate setting offers its guests the feeling of being in Key West with its palm trees, laid back atmosphere, and the Backyard Bar that is open to the public. They specialize in working with their guests to create a personal experience whether they are staying the night, having an event, or just stopping by for a drink at our bar. Young Professionals of the Palm Beaches (YPOP) provides a great opportunity for professionals under 40 to network and educate themselves on important issues facing the Palm Beach County area. The Chamber of Commerce of the Palm Beaches encourages YPOP members to become more involved throughout the community and serve as leaders in the area. If you are interested in joining YPOP please contact Marissa Kosiec at mkosiec@palmbeaches.org or visit our webpage here.